Shows the 'Fourth Partition of Poland' following the Napoleonic Wars. 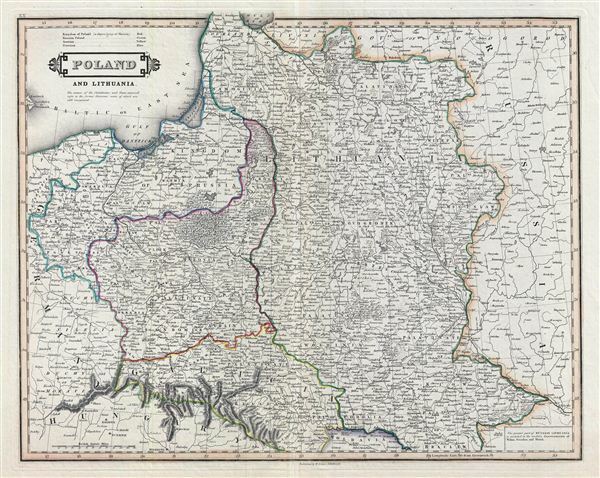 An exceptional example of Daniel Lizars' 1831 map of Poland and Lithuania. Lizars' map covers Poland following Napoleonic Wars and the treaties of the 1815 Congress of Vienna. Twenty earlier, in 1795 The Polish-Lithuanian Commonwealth was dismembered and divided between Russia, Prussia, and Austria. During Napoleon's brief period of hegemony in the region he resurrected Poland and Polish hopes for solidarity in the form of the Duchy of Warsaw. Following Napoleon's defeat at the Battle of Waterloo, the Victoria powers repartitioned Poland roughly along the lines of the 1795 Third Partition. This event is often referred to as the 'Fourth Partition of Poland' and reflects the borders presented here. Color coding identifies the powers that controlled each part of Poland with green representing Russia, Austrian claims in yellow, and Prussian dominions in blue. A third zone, highlighted in red, is identified as the 'Kingdom of Poland.' This region, surrounding Warsaw, is often called Congress Poland or the Tsardom of Poland, and was, though nominally independent, in effect a dependency of Imperial Russia. The cartographer attempts to identify the regions ceded in the various partitions with circular date cartouches here and there on the map, but lack of proper edification make these difficult to interpret. Relief is shown by hachure with towns, cities, and major topographical features identified. This map is a steel plate engraving by D. Lizars and prepared for inclusion in the 1831 edition of the edinburgh Geographical and Historical Atlas. Lizars, D., Edinburgh Geographical and Historical Atlas, (Edinburgh) 1831. Very good. Original centerfold. Blank on verso. Original platemark visible.